For those looking for good Catholic commentaries on the New Testament, I'd like to remind everyone about the Catholic Commentary on Sacred Scripture Series, which includes volumes by Peter Williamson, Mary Healy, Curtis Mitch, Edward "Ted" Sri, and several others. This is a great resource for those looking for a critically informed yet theological and liturgically sensitive commentary series. Click here for more information. This is a very fine commentary series, ideal for the average "man in the pew." I've read all the available volumes except Matthew. I especially enjoyed the commentary on 2 Corinthians and Ephesians. If you go to the volumes and authors page and click on one of the book icons you can then find links to excerpted portions of the work (you have to scroll down slightly for them). Unfortunately, the Matthew volume offers little in this regard. I love Edward Sri's stuff. He's one of my favourite current theologian speakers. I might get that one on Matthew right now! I'm also trying to study Ephesians right now, but there's not a lot of speakers on Ephesians. I think Ephesians perhaps is the deepest of Paul's epistles in terms of depth in few chapters. It's only six chapters long, but I feel as though I could take as long with it as I do with Romans. Trying to exhaust the blessing from 1:3-14 is enough to use one whole hour. Unfortunately Scott Hahn's CD set is only five CDs long. He had one day to get through Ephesians, and as he admitted, he just couldn't do the book justice. I might get the one of Ephesians too! I forgot to add: Scott Hahn will be contributing to this series. He's going to do the study in the Book of Romans, which I expect to be the best book in the series. I hope Hahn will do more scholarly bible stdy books, like his recent Chronicles one in the future! It occurs to me that this series would be ideal for the upcoming Year of Faith (Oct. 11,2012). The Holy Father wants the catechism to loom large in this special year and the series makes deliberate and frequent use of it. One could also mention Hahn's and Mitch's ongoing commentaries on the entire Bible. DR.Bergsma , Any Idea when the commentaries on the Gospel of Luke and John are coming out? Bergsma should be doing the one on the Gospel of John. Yikes FUoS are expensive though! Maybe I should be, but I am NOT doing the one on John! I'm working on a textbook on the OT for Ignatius Press! 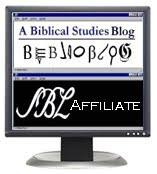 Plagiarists: Beware of Biblical Scholars!